The weather is getting nicer every day now! That means we will be going on club drives more and more. What does that mean? It means driving in a group. Driving in a group is different from our everyday drive to work or to the store. Instead of just worrying about yourself and the other traffic, now you have to consider keeping with those in your group. The first thing you need to consider is safety and being mindful of the traveling public. You need to remember you are responsible for watching for changing lights, oncoming traffic, cross traffic, pedestrians and bicycles. (Just because the car in front of you made it through the intersection doesn’t mean it’s safe for you.) Because of that, you will not always be able to safely keep up with the group, but with a little teamwork, we should all be able to get to our destination safely. ● Destination – where we are going. ● Drive organizer – usually a group leader but not always. Drive organizer holds drivers meeting before start of the drive. ● Group – depending on the total number of cars on the drive there may be 1, 2 or 3 groups. Each group should have a Designated Leader and Caboose. The other cars stay between the two. ● Group Leader – the first car of the group and knows the route. ● Caboose – is the last car in that group. Caboose will stay at the back and makes sure that no one in the group is left behind. The caboose will notify the leader if this happens. The Caboose should know the route in case he/she may have to lead stragglers. Drivers’ Meeting – During the drivers’ meeting, the route, distance to next stop and any known hazards should be discussed. The leader(s) and caboose(s) will be announced. In addition, what CB channel(s) we will be using. A sign-in sheet will be passed around so the leader will have the drivers’ and passengers’ names and cell phone numbers in case we need to call someone to pass on information. If there is more than one group, each leader should hold a separate drivers’ meeting because they may not be going the same route. Starting out – Everyone lines up in their group. Drive in the position you are comfortable in for everyone’s peace of mind: Faster drivers near the front; those more comfortable going slower, toward the rear. When we leave the parking lot, we try to stay together but it is not always possible, so try to keep an eye on where everyone is heading. We can regroup later if needed. On the drive – Pay attention to the cars immediately in front and behind you so you will notice if they have signaled or radioed for a stop or if they are in trouble. Help communicate to the leaders, if they can’t. Going through town, we inevitably get separated by red lights so try to keep an eye on where everyone is heading. Do not try to beat the light to stay up. We will wait for you at a safe pull out. Breadcrumb – We sometimes get spread out, so if we do and part of the group makes a turn, the last car in that first part of the group will need to Breadcrumb. Crumbing is when you pull off to the side of the road right before or after the turn, so the following cars will know where the first part of the group went. Once the lagging cars catch up, the car that crumbed pulls out and leads the way. Again, in most cases we will pull over and regroup up the road. If you get separated by a stop light or stop sign assume you should proceed straight unless you see a breadcrumb for a turn. Caterpillaring – When the group has to (safely) pull off on the shoulder, the group leader should make sure to pull far enough forward so that there is room for all the cars. When the leader is ready to go they will radio the caboose, and, traffic permitting, the caboose will pull out at a 45-degree angle to stop traffic. Then the rest of the group should all pull out at a 45-degree angle all at once and then straighten out in the lane. This method makes for a quicker return to the highway. This same principle is used to change lanes. In order make room for the group to move over, the caboose gets into the desired lane holding a gap for the others to move into. Passing other traffic – Passing in a group should be done as quickly and as safely possible. 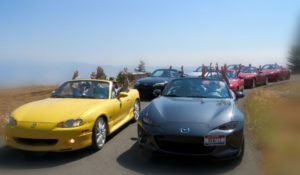 Stay in the right lane until you are ready to pass the vehicle and there is sufficient room for you to reenter the right lane behind the other Miatas. Remember to pass with purpose, and don’t stay beside a slower moving vehicle for any longer than absolutely necessary. Giving the leader visual contact with the caboose – If we are on a long stretch of straight road and you notice your leader and the caboose move to the center line, the rest of the group needs to move slightly right to the fog line so the leader can check out the number of cars and see the caboose. Spacing – Always try to maintain the same spacing between the car ahead and yourself, this way you do not create that slinky see-saw, run-up run-back situation. We know that some drivers like to keep 3 to 5 car length between the car in front; we can work with that. Here are a few more pointers to make our club drives more enjoyable. Make sure your car is ready for the drive. (Tires, brakes, battery, radiator, oil, window washer fluid) If you are not sure it can make the trip, then don’t risk it. If you have an engine/transmission problem, I would advise against any drives that will leave you stranded. Get a good night’s sleep the night before the drive so you will be more alert to what other drivers are doing. Eat a good breakfast. We usually stop an hour or so into the drive for a restroom break. We always start each drive with a drivers meeting to review key points for this leg. Pay attention so you know where the drive is going next, just in case you get separated. The leader will have the drivers’ and passengers’ names and cell phone numbers, but it is a good idea for you to add the leader’s cell phone number into your phone for handy reference in case you need it. Keeping your member directory with you is a good idea. It is best if you have a working CB radio for communication on the road, but ok if you don’t. Cell phone reception is not always available. But remember that CB radio communication is far from perfect. Especially with route information communications, pass on messages between the leader and caboose if they are not acknowledging. They probably didn’t hear the message . Don’t assume the cars around you hear the message; be a breadcrumb at turns if you are not sure. If you need the group to stop and have no radio contact, let the other drivers know by either holding up a fist if your top is down or flashing your lights. If that hasn’t worked, when you get to a place to stop, turn your turn signal on for some distance before and go ahead and turn in. The cars behind you will pull in and stop as well as communicate to the lead car. If you do get lost/separated from the group and have no radio to contact the others, continue to the next pit stop or other regrouping stop in your route directions. A cellphone call or text to the leader can also help. Please feel free to “do your own thing”. If you do decide to leave the group, please make sure the drive and group leaders know you are leaving and where (or if) you’ll be meeting up again. We don’t want to waste time (and temper) waiting for you if you’re not coming, or looking for you when you are not lost. If you communicate by radio, make sure someone acknowledges that you were heard. A cell phone may be the way to get the message through, but service will be limited in the mountains. Remember we are one of the smallest cars on the road. You need to think like a motorcyclist – “everyone is out to get you”.